Grossarl, in Austria, is the perfect travel destination when you need active relaxation or simply a weekend getaway. If you’re looking for an active relaxation destination in the Austrian Alps, consider Grossarl for a weekend getaway. You’ll come back feeling refreshed…and looking forward to your next visit. It’s the ultimate travel destination if you’re seeking active relaxation – my favourite type of relaxation. It offers a mix of activity, in this case, hiking, but with spa time and time to relax as well. Located just 86 km south of Salzburg or 205 km if you’re coming from Munich, it’s a perfect weekend getaway in the Austrian Alps. It’s far enough away but not too far away. It’s also small enough with just 3600 inhabitants to not get lost but still, have a choice of restaurants and services, without having an overwhelming choice. Grossarl is often referred to as the valley of alpine cottages, or in German, Das Tal der Almen, for the 40 or so mountain huts. 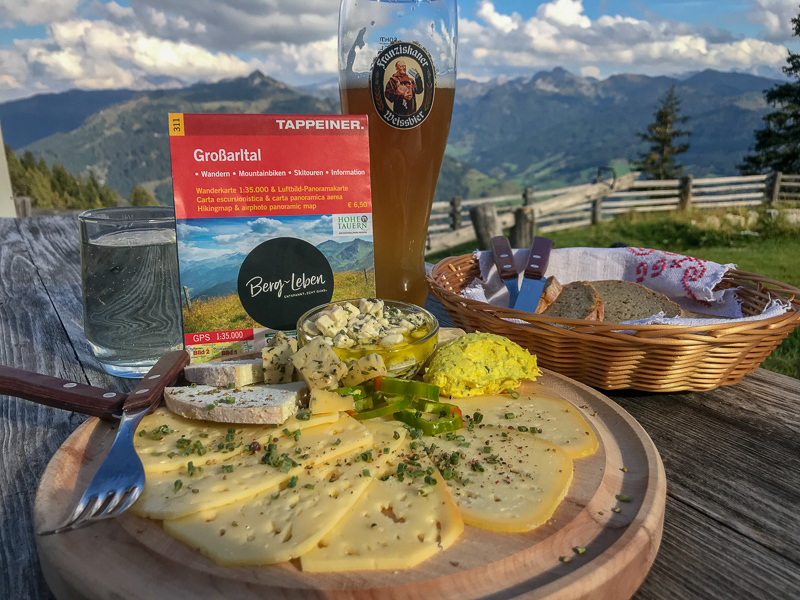 They offer plenty of opportunities to relax while hiking and will tempt your palate with local Austrian specialities. One of the 40 or so mountain huts that serves great local food. We visited Grossarl in mid-September. Fall is a fantastic time to visit. It’s off-season so the accommodation prices are cheaper, the weather is still warm enough for hiking, yet it’s late enough in the season to escape the summer crowds. The fall hiking in Grossarl is gorgeous! Having said that, it’s most popular in winter with skiers, notably the Grossarltal-Dorfgastein ski area and other winter sports enthusiasts. The next most popular time of year to visit is summer. We were there in the offseason which I loved. So basically, anytime is a good time to visit Grossarl – depending on what you want to do. Grossarl offers an incredible 400 km of signposted hiking trails, many leading to one of the 40 or so mountain huts. Yet despite the choice, it’s not overwhelming. I also loved the fact that you can reach the starting point for many of the hikes from walking out your hotel door. 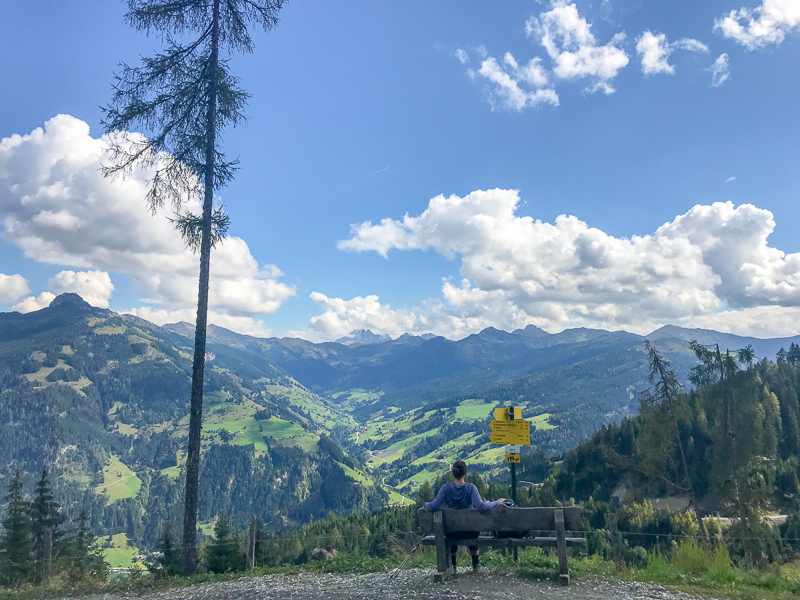 I was also fortunate enough to get hiking recommendations from Maria, one of the owners of the recently renovated 4-star Berg-Leben Grossarl Hotel where I was staying. One of her recommendations was the Shuhflicker. This hike is a ridge walk that culminates in a mountain peak (the Shuhflicker) which offers views for miles, including a gorgeous lake view. And as you’d expect, there’s also a mountain hut on the way down. We finished in time to enjoy the sauna and relaxation area at the Berg-Leben Hotel. Sauna time is an important part of active relaxation. On our second day, we hiked to the Saukarkopf, one of the most beloved mountains in Grossarl. After stopping at one of the mountain huts, our plan was to do the Saukarkopf Klettersteig (via Ferrata). It’s only 150 m long but is challenging right from the start with a steep rock face and the entire route is at a C-D level. We quickly discovered that our via ferrata skills are currently more at a C level. We made it to the peak, just not how we planned. Feeling slightly defeated, we returned and hiked up to the peak instead. It’s important to know your limits when you’re in the mountains. We knew we’d made the right decision. 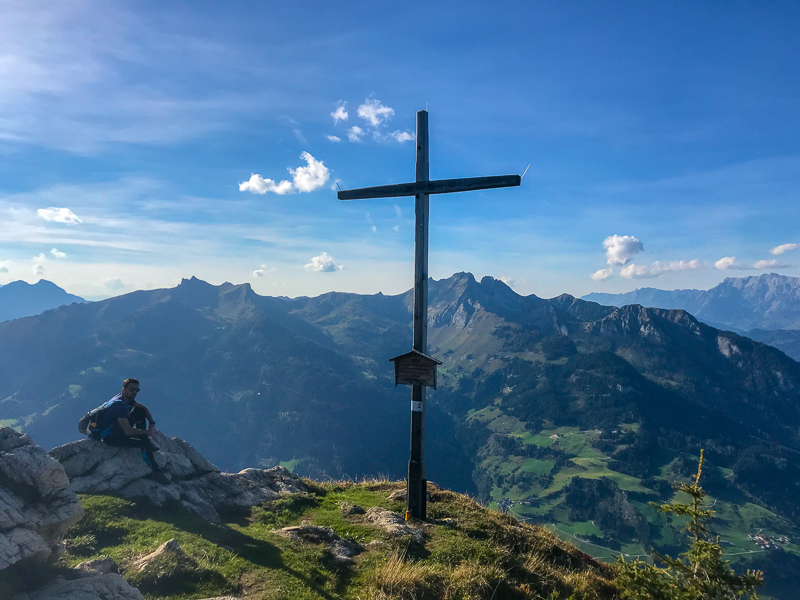 You’ll find a variety of mountain adventures in Grossarl ranging from hiking, themed hikes, Klettersteigs (via ferratas), mountain biking and e-biking in summer, fall and spring. You have a choice of mountain adventures in Grossarl including hiking, mountain biking and e-biking. In winter you can ski, ski tour or snowshoe. We stayed at the recently renovated locally owned and family run Berg-Leben. I loved our stay here. The style is urban-Alpine style so it feels cozy, yet modern. We stayed in the Lifestyle Junior Suite and the room was huge. It was also one of the most comfortable beds I’ve ever slept in. The Lifestyle Junior Suite at the Berg-Leben Hotel. I loved our room. I also loved the little touches. Each room has its own name for example. There was also a coffee table book (in German) about living a positive life. I loved the book so much that I bought it. There were also two apples waiting for us. The breakfast buffet also had a really nice selection. It was far beyond the bread yoghurt that most hotels in Austria serve up. They also gave me an incredible selection of gluten-free bread – something that almost never happens. I’ve stayed in a lot of hotels after working in the travel industry for over 8 1/2 years and I’ve come to realize that it’s the small touches that make a world of difference. They show that the owners really care, and take pride in their hotel. Maria, one of the owners, gave us a hiking map and took the time to show us her favourite routes. It doesn’t get any better than recommendations from a local. Hiking map and mountain hut recommendation from Maria, one of the owners of Berg-Leben. There’s also a small spa with two saunas and a relaxation area with mountain views. We were lucky enough to have it all to ourselves – another advantage of travelling in low season. After a day of hiking, relaxing seems even more enjoyable. It’s all part of the active relaxation experience. Note: My stay was complimentary provided by Berg-Leben. As always, all opinions are my own.